We are unable to find iTunes on your computer. 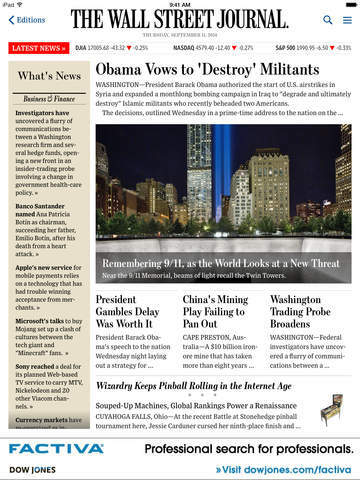 To download the free app The Wall Street Journal. 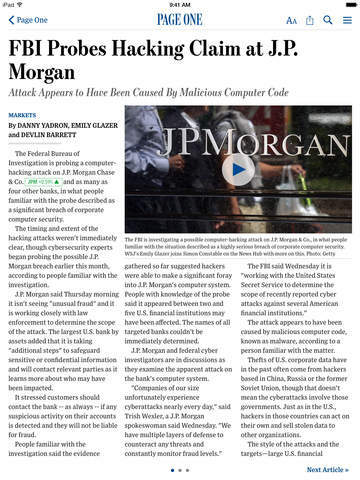 by Wall Street Journal, get iTunes now. The App That's As Ambitious As You Are - Subscribe Today and Get 4 Weeks Free! Now with Evernote Premium*. 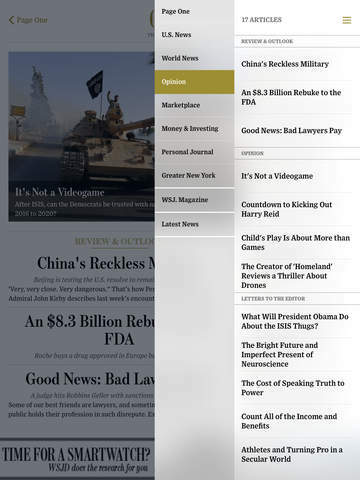 The new WSJ app is an immersive digital news experience modeled after the iconic Wall Street Journal newspaper. It brings you the latest news, as well as expert commentary and analysis from around the world, with enhanced features and visual storytelling that bring the Journal to life. 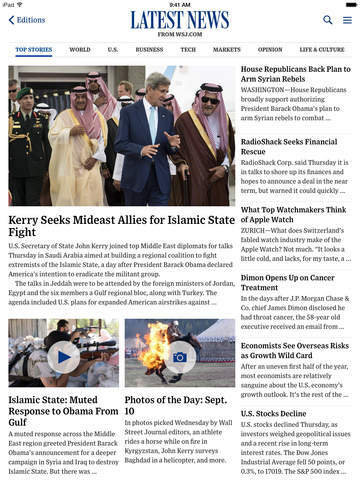 And it’s all delivered through a cleaner, simpler interface so you can find the news you need, anywhere you need it. -Streamlined navigation consistent with the structure of the paper, while offering quick access to breaking news and analysis. 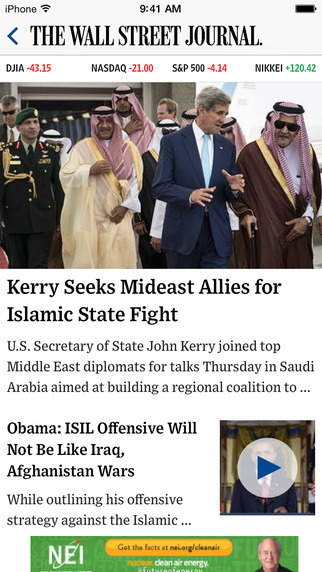 Subscribe for $22.99 per month to receive unlimited digital access on iPad, iPhone, all other WSJ tablet & smartphone apps, and WSJ Online. *A complimentary one year subscription to Evernote Premium is currently available only to U.S. subscribers who are eligible for WSJ+. We are committed to making ongoing improvements to the performance of our app. In future releases, look forward to detailed company quotes, a market data center and additional feature enhancements. Many of my concerns are captured in other reviews, but here is my big issue. The older version would download the entire paper for offline reading. This version WILL NOT. You literally have to go through each section to get all of the headlines to download, and then to be sure that all content is downloaded, you have to scroll through each article. That’s unacceptable. I’ve been caught a couple of times now where I thought the whole issue was downloaded, and then it wasn’t when I started reading out of wi-fi range (like on a plane). I don’t know about this version, but the older version also had an issue where connecting to semi-free wi-fi on a plane locked me out of the app. As best I can tell, the app calls out to a server every few minutes to authenticate you, and when it sees an internet connection and can’t call out (because you didn’t pay for full internet access), it thinks you’re not a legitimate user. Once this problem happens, you’re toast until you reinstall the app, even after you get to a full wi-fi connection. The only solution is to turn off wi-fi in the presence of a semi-free access point. On the plus side, the app now tracks which articles you’ve read. Of course, when you have to scroll through all of the articles to make sure they’re downloaded, you find many of them are then marked as read. 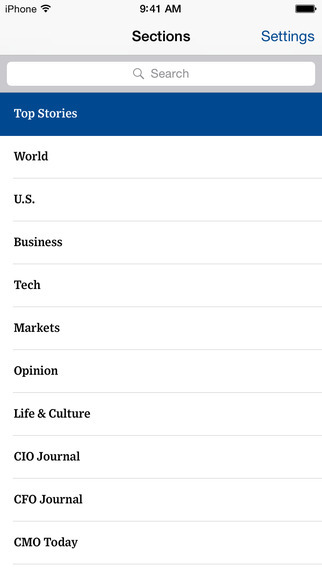 I really want to love this app because I love the WSJ, but I can’t until its problems are fixed. If it was not for the good content, I would have thrown this app to the curb long ago. Of course, the app is trying my patience so much, I may finally give into the urge to cut lose. Pretty sad since I probably spend more time in this app than any other (average of 30 minutes per weekday). Where to begin w complaints: the app is unstable (and always has been). If you turn off cellular data (since the app is a data hog), it crashes frequently or does not let you pull up articles). Then there was the time I had to restore my entire iPad set up because all my other apps would not update and they became unusable. 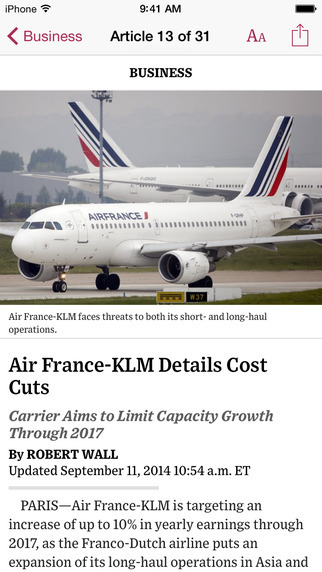 Only after hours of work did I come across a thread that said that this problem was caused by a faulty WSJ app update. While I did not see how it was possible, I deleted the WSJ app, and miraculously, all my other app updates started working again. also, in one of the more recent updates, they eliminated the ability to proceed through all of the top stories in order. Please bring this back. Biggest pain point of app is that it does not support offline reading well. If you open the app it will check for updated content and prevent you from accessing the previously loaded, latest content. This is huge problem in NYC on subway. I want to read my paper on the ride to work but frequently end up with a blank screen because the phone has no reception underground and the app is not smart enough to give up searching for an update and giving me the previously loaded content. With content updates happening all the time during the day this is a huge problem. 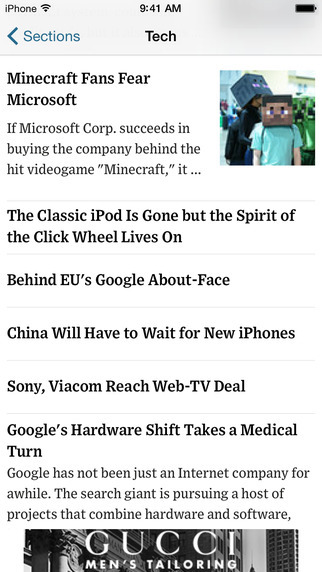 There should just be a button for a manual update so the user can decide when to load new articles. It is also inconceivable to me why the app would not go back to the old content automatically if it can't find an update within let's say 30 seconds. It's very frustrating - I hope this app is being significantly improved very soon. © 2014 Dow Jones & Company. All Rights Reserved.